You have sent out your resume to a bunch of businesses and have hunted for hours online. And yet, don’t seem to hear back. The frustration level is at its maximum because you don’t know what more to do to please these hiring managers. What gives? That’s the perfect answer. Wait.. Perfect question, you mean? No. 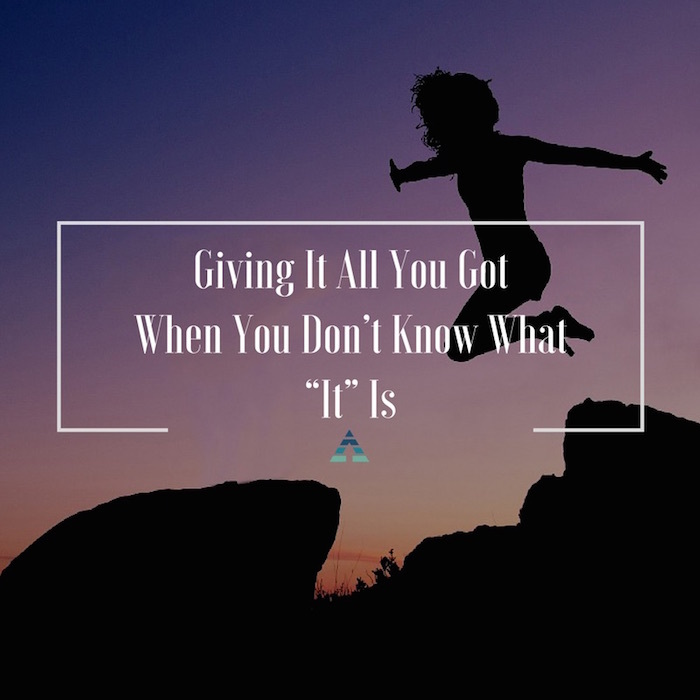 The answer is, “What gives?” When you’re job hunting, you’re in the process of giving - your energy, resources, and time - maybe even blood, sweat, and tears! I’ve heard a thousand times, “What more can they possibly want from me?” They. “They” the individual hirers who ignored your calls, turns into the company, turns into the job market, turns into the economy, turns into the country, then the world - and then, finally life. What can they all possibly want more of now? What could I possibly get from all this giving? I’m running a business, not a charity! This is where mental focus and emotional energy is misdirected. You have a lot to give, but not without a lot of expectations. Expectations can get you down in a way that you’re so focused on an expected outcome that you can’t see the opportunities that could be potentially better than what you think you want. I hear many groans, “Is it too much to get back what I gave?” Golden rule and all? Absolutely not, but you could be closing out what you really need by blocking it with so much expectation. I’ve heard clients say, “I’m just hustling for a job. I just want enough to pay my bills.” So, they spend all this energy and get just that - enough to pay the bills - and nothing more - to keep doing what they’ve been doing. You’re just feeding the machine, but not getting any reward. And, they come back with self-doubt and blame (they) wondering why they can’t get the opportunities they see in their mind and can’t organize their mental, emotional, and material faculties to express. 1. Focus on what you really want to do. Not just the goal - goals are easy, it’s the purpose that is mystifying to most. The former is limiting. You put all your resources and steps into that first ideal and you’ll get just that. Just don’t be disappointed when you get what you asked for. The latter examines your motivations (children’s needs, clients’ goals) which are bigger picture and can be fulfilled by more than just money. Your creativity and consciousness ramp into gear. The second saying that everybody profits means we all take what we put in and take home what we all need. In short, be more specific on your purpose and be flexible with how you achieve your goals. 2. Look at what you have to give and achieve - beyond the measurable. Some of the downtrodden look at what’s limiting and scarce and as a result what separates us. If you believe that job hirers are just looking to take up your time, make you work to get a job (yes, you do), and all to just cast you aside, you will likely believe that, and, with a great huff, act as such, too. The prophecy is all-too eerily self-fulfilling. However, if you look at the process as an exploration, the change to be authentically you, and an opportunity to expand on and learn more, then you’ll get something out of it - even if you didn’t get the job. Sometimes, failed job interviews are opportunities to learn things like, “Gosh, that kind of work environment is not for me.” Or, I learned to stand my ground in negotiations.” Or, “Next time I need to come prepared.” These lessons expand you and in no way does the experience limit you. Unless you allow it. 3. Purposeful giving leads one to act. Act on what you put clarity of vision and purpose on - and act on the new wisdom you’ve gained (even during periods of perceived failure). Acting is building motion, acting in mindfulness of what you’re really attempting to achieve and with the information you’ve gathered along the way will create your unique career path. So keep giving your job attainment strategy all you’ve got - you’re going to get more than just a job, if you’re lucky enough to recognize the opportunities.